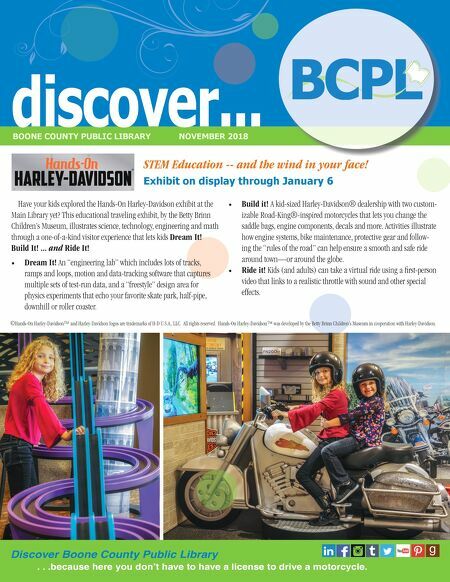 discover... BOONE COUNTY PUBLIC LIBRARY NOVEMBER 2018 L Boone County Public Library BCP Have your kids explored the Hands-On Harley-Davidson exhibit at the Main Library yet? This educational traveling exhibit, by the Betty Brinn Children's Museum, illustrates science, technology, engineering and math through a one-of-a-kind visitor experience that lets kids Dream It! Build It! ... and Ride It! • Dream It! An "engineering lab" which includes lots of tracks, ramps and loops, motion and data-tracking software that captures multiple sets of test-run data, and a "freestyle" design area for physics experiments that echo your favorite skate park, half-pipe, downhill or roller coaster. • Build it! A kid-sized Harley-Davidson® dealership with two custom- izable Road-King®-inspired motorcycles that lets you change the saddle bags, engine components, decals and more. Activities illustrate how engine systems, bike maintenance, protective gear and follow- ing the "rules of the road" can help ensure a smooth and safe ride around town—or around the globe. • Ride it! Kids (and adults) can take a virtual ride using a first-person video that links to a realistic throttle with sound and other special effects. STEM Education -- and the wind in your face! Exhibit on display through January 6 Discover Boone County Public Library . . .because here you don't have to have a license to drive a motorcycle. ©Hands-On Harley-Davidson™ and Harley-Davidson logos are trademarks of H-D U.S.A., LLC. All rights reserved. Hands-On Harley-Davidson™ was developed by the Betty Brinn Children's Museum in cooperation with Harley-Davidson.